New all-time highs for the stock can be boiled down to just a few blockbuster figures. Netflix (NASDAQ:NFLX) stock hit a record high just before its fourth-quarter earnings release last week as investors bet the streaming giant would show healthy growth over the seasonally strong holiday period. The company didn't disappoint. In fact, it blew past management's forecasts on both sales and earnings. Here's a look at the three trends that confirmed shareholder enthusiasm and sent the stock to new highs in the days following the report. 1.85 million users -- Netflix outperformed management's guidance by nearly 2 million subscribers, pulling in 7 million new users compared to its forecast of just over 5 million. It was the company's biggest quarter of growth yet, driven by strong gains in both the U.S. and international segments. Netflix exceeded its U.S. forecast despite boosting prices on a significant chunk of the user base. Average revenue per subscriber jumped 15% as the company finished migrating the entire domestic base to the higher monthly pricing tiers. Those gains demonstrate impressive pricing power, and they show that many of the customers who bolted over the past few quarters because of the hike have decided to come back. In other words, the surge of cancellations early in the year turned out to be a one-time blip, just as management forecast. The outperformance also meant Netflix enjoyed accelerating growth for the full year. It added 19 million new users in 2016, compared to 17.3 million in 2015. Subscriber growth in thousands. Chart by author. Data source: Netflix financial filings. $16 million -- The international segment has been responsible for significant losses over the past few years as Netflix poured resources into establishing itself in almost every country around the globe. 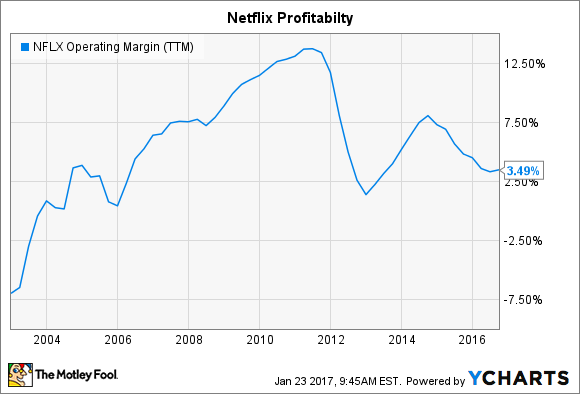 Yet for the first time, CEO Reed Hastings and his team forecast a slight profit from the division, of $16 million in the current quarter. That's a drop in the bucket compared to the loss of $104 million in the prior-year period and a total loss of about $300 million over the past 12 months. International contribution in millions. Q1 is projected. Chart by author. Data source: Netflix financial filings. The international segment should slip back into the red later in the year, which means this quarter's slight profit is just a consequence of the timing of costly content releases. However, the long-term trend points to mounting profits as Netflix earns brand recognition and takes full advantage of the favorable economics for global content licensing deals as opposed to country-by-country releases. 7% -- Investors finally got some explanation as to what Hastings and his team meant last year when they promised material global profits beginning in 2017. The company is forecasting a 7% operating margin for the entire business, with significant gains in the U.S. side offsetting the improving losses on the international piece. The company enjoyed stronger figures -- reaching into the double-digits -- before it began its huge global expansion. However, 7% would mark a solid improvement over the past two years. It's also just a stepping stone to improved profitability, since management could at any time raise operating margin by investing less on growth drivers like content and tech improvements. Executives would rather focus on building a defensible market position around the world first, though. "Our global margin strategy is to expand internationally as fast as possible while staying profitable," they explain in their updated long-term plan. "We are targeting a 7% operating margin in 2017 and plan to steadily increase operating profit and margin from there as we balance growth with profitability."